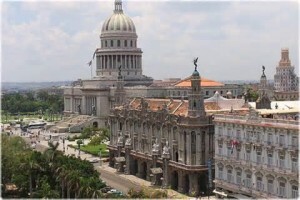 People to People Citizen Ambassador Programs* (Ambassador Programs, Inc.) is working with Dr. Stephen Condrey to plan a public administration program to Cuba. This trip is scheduled for April 24 through May 2, 2015. Availability is limited. Early pre-enrollment gives you the best opportunity to reserve your space before it’s gone. To confirm your interest, call (877) 787-2000 or email [email protected]. Additional details, including the preliminary itinerary, are available at www.peopletopeople.com/ASPA. Be on the lookout for more information coming soon. We hope you can join us in Cuba! *Under license (CT-2013-305247-1) by the U.S. Department of Treasury, Office of Foreign Assets Control, you can legally travel to Cuba with Ambassador Programs, Inc. (People to People Ambassador Programs) if adhering to the guidelines outlined on the delegation’s website.